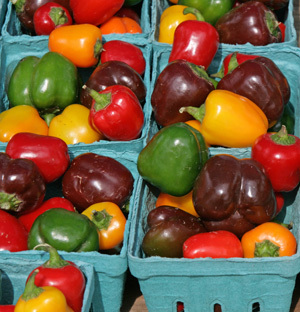 Sweet peppers come in a rainbow of colors and shapes. Sweet peppers bring a rainbow of colors and a plethora of shapes to the table. It is easy to value them for looks and flavor alone, but the sweet pepper is a nutritional powerhouse as well. A serving of the most popular type in the USA—the sweet bell—contains more vitamin C than the average orange, a generous amount of vitamin E and many antioxidants with only 29 calories. Peppers have high nutrient levels at any stage but are the most beneficial when eaten fully ripe. The few colors of bell peppers in the average supermarket are only the beginning—blocky shaped bell peppers can ripen to many colors; ivory, pink, purple, red, yellow, orange and chocolate. Sweet peppers come in many shapes as well; the elongated banana, the blocky bell, the oblong or “half-long” bells, flat “cheese” shapes, and smooth cherry types. 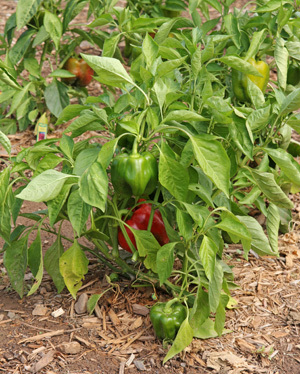 Home gardeners can find many varieties of sweet pepper plants available at a local nursery. True enthusiasts usually branch out from there and spend the winter perusing seed catalogs, on-line shops and seed swaps for unusual colors shapes sizes and flavors. The variety and nuance of sweet pepper flavor compares to fine wine, coffee, or chocolate. Sweet peppers are also similar to other foodie obsessions in that many cultures and regions have different favorites. 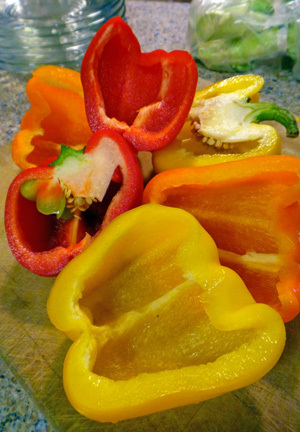 Cooks love the flexibility and wide spectrum of possibilities sweet peppers offer in the kitchen. Pepper plants are easy to grow, require very little space and are an attractive addition to any garden, yard, or balcony and that is the reason National Garden Bureau chose 2015 as the Year of the Sweet Pepper. Peppers are native to the Americas. Peppers are native to South and Central America, tracing back to the Oaxaca region of Mexico somewhere between 4000 and 6000 B.C. Ancient complete and partial peppers have been found, well preserved in caves during archaeological excavations. The way the peppers were found suggests that they were consumed as both dry seasoning and fresh. Researchers conclude peppers were harvested whole and dried then ground up for seasoning when needed. Dried peppers are light in weight and can store for thousands of years. Perhaps peppers were the first convenience food! Over the years peppers became popular across the Americas. The name “pepper” was coined by Christopher Columbus and other Spanish explorers of the Americas who were looking for plants that would produce peppercorns to be used as a spice. Peppers were taken back to Europe and became very popular, especially in warm summer regions in southern Europe. Peppers have become a key ingredient in the diet of countless cultures. Peppers are an important crop in many countries, including the U.S.
Republic of China, Mexico, Indonesia, Turkey, Spain, United States, Nigeria, Egypt, South Korea, and the Netherlands. Each country may grow for export or for local needs. 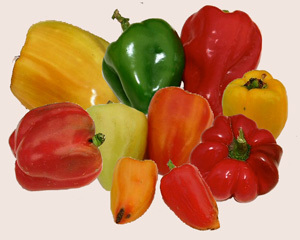 In the United States, most bell peppers sold in supermarkets are grown in Florida. 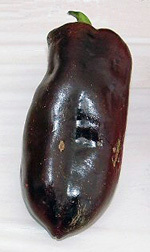 Other pepper producing states are California, Texas, New Jersey, and North Carolina. Recent trends in commercial pepper production include increased greenhouse production in order to reduce transit time and grafting for disease resistance. Consumers have enjoyed mini snacking type peppers as they have gained popularity nationwide. Companies that breed pepper seed are always looking to improve plant health, fruit yield and product quality in order to make the best use of limited land and water resources. Sweet bell peppers are a cultivar of Capsicum annuum. (A cultivar is simply a horticultural term for a group of cultivated plants given a unique name for a set of desirable characteristics.) 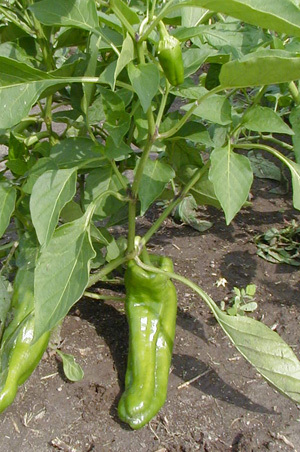 Non-pungent banana peppers, sweet jalapenos and sweet cherries are also members of Capsicum annuum. Currently Capsicum includes at least 25 species, four of which are domesticated. Most of the commonly grown bell peppers start out green. Sweet peppers are called sweet because they do not produce capsaicin—a chemical that causes a “burning” sensation when hot peppers are consumed (or when they come in to contact with the eyes or nose etc.). Sweet peppers lack capsaicin due to a recessive form of a gene that eliminates capsaicin and, consequently, the “hot” taste usually associated with the rest of the Capsicum genus. Sweet peppers are actually a fruit (because they come from a flowering plant and contain seeds) but treated and spoken of as a vegetable. Worldwide, each culture has its own preferred shapes, textures colors, flavors and recipes. 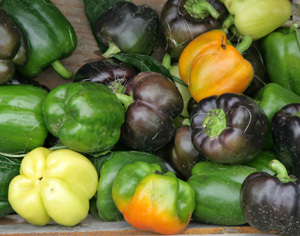 Bells are sweet peppers with a blocky shape, and come in many colors from off-white to purple. 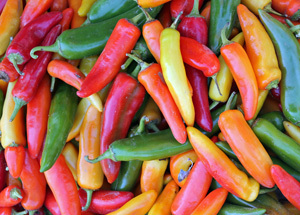 A few examples of the plethora of sweet pepper types grown are bells, Bull’s Horn, snacking mini-peppers, half-longs, sweet bananas and sweet jalapenos and sweet habaneros. 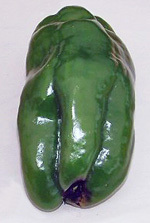 “Bell” is a term used in the U.S.A. that refers to sweet peppers with 3-4 lobes. Bell might either refer roughly to the fruit shape or to the pendulous way the fruit hang from the plant. In the U.S. agriculture industry, the 3-4 lobed fruit that are nearly as wide as they are tall are referred to as “blocky” bells and the elongated bell peppers (which are not as common in North America) are called “half-long” bells (half as wide as they are long). Bells can be found in many colors including red, yellow, orange, purple, chocolate and ivory. Mini-snacking peppers come many colors. Mini-Snacking peppers have been popular with home gardeners for many years and have gained popularity in U.S. grocery stores in the last 10 years or so. They are blocky, pointed, thin-walled, sweet, and come in bright colors including, yellow and orange. The best snacking peppers are crunchy and have just a few seeds or no seeds at all. And now we enter the dangerous territory of varieties that can be either sweet or hot. Bananas are long and thin and usually mature from a light green or yellow to red. They are used fresh and pickled as rings. Because there are both sweet and hot banana peppers available, be sure and order the seed or buy the plant you prefer. Sweet jalapenos and habaneros are also available though not as common. They are worth searching out—the flavored revealed by removing the burn is a pleasant surprise for the pepper enthusiast. Start peppers indoors from seed 8 weeks before the average last frost. Start seeds indoors in a warm spot about 8 weeks before the last frost date. Pepper plants can suffer from transplant shock so plant them in a biodegradable container that can go right into the garden later. Keep the soil warm (at least 75 degrees) and damp. Do not transplant until days are at least 65 degrees and nights are above 55. In the nursery look for bright green plants with shiny, perky foliage. It is better to buy younger plants that have not yet flowered when possible. Older plants can become stunted and root-bound in the tiny starter containers and will not transplant as well as smaller, younger plants. Plants can sometimes become stressed in some garden centers. 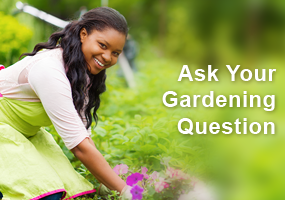 Choose a garden center that cares for its plants and waters regularly. Make the nursery your last stop—don’t leave new plants in a hot car or truck bed for any longer than you need to. The best technique is to ready your soil and area in advance in order to get the plants in the ground quickly. Late afternoon planting causes the least amount of stress to young pepper plants giving them a night to adjust before they need to survive the first day of sun. Sweet peppers are easy to grow in the home garden. Peppers like a sunny spot. They grow best in a location where plants from the same family have not recently grown—crop rotation is important for peppers (and tomatoes and eggplants). Soil should be loose and amended with compost or a vegetable soil mix from the garden center. 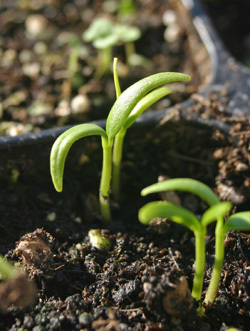 Introduce your seedlings to the garden gradually and transplant during mild weather or in the late afternoon if possible. Transplant shock can slow the maturity of the plant and affect fruit quality and quantity. If planting in rows set peppers 12-18 inches apart in 24-inch wide beds. If planting in squares or in flowerbeds etc. allow 12-18 inches of space around each plant. Fertilize about every two weeks, especially if you notice the plants become pale. 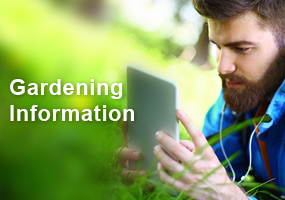 Stop fertilizing once the plant blooms so that it can put its energy into fruit set. Pepper plants prefer full sun, but if you live in a very warm area look for varieties that have “good coverage” of fruit. A full leaf canopy will prevent fruit from sunscald. Scalded fruit, though less attractive, are still edible and taste the same. Sweet peppers will continue to bloom and set fruit until the first frost. Plants will continue to bloom and set fruit until the first frost. If temperatures are above 85 degrees, or very cool, flower set and fruiting may slow down. Keep the plants watered and wait out the weather—they often will rebound if conditions improve. At the end of the season, cut down and remove plants and add mulch or plant a cover crop for the next year. 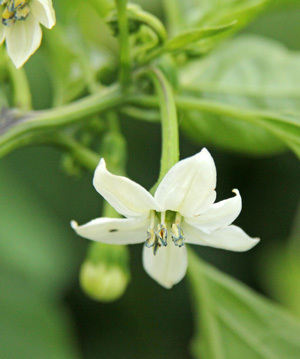 Pepper plants are fairly hardy and not as attractive to insects as other vegetables in the garden. To avoid conditions spread by water it is best to keep the leaves as dry as is possible by drip-line watering or giving the plants time to dry in the sun if they are watered from overhead. Pale leaves can indicate that the plants need fertilizer. Big, healthy plants that fail to bloom can indicate over-fertilization. Space plants as instructed by the plant tag or seed packet. Plants that are planted too close will lack air circulation. Proper air circulation improves pollen distribution which is needed for fruit set. Crowded plants are disease prone and do not set as well as those that have been properly spaced. 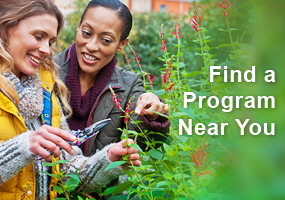 The best way to diagnosis an unknown problem is to take a photo of the area and a close up of the problem and show them to an expert in your area—an extension agent or local nursery employee. Peppers can be grown in containers (in the back of this photo). deeper than it is wide. The baby plant will look a little lonely at first but will grow to fill the container quickly. A benefit of container growing is that the plant can be introduced to cool nights or warm days gradually to avoid shock. In the spring, bring plants indoors when nighttime temps are below 55 degrees. Introduce the plants to warm days (over 85 degrees) a few hours at a time until they are acclimated to their final location. 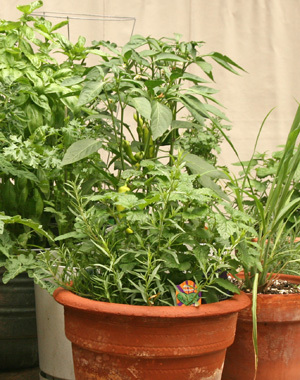 Once plants are established, water every few days (or when soil is dry and pulling away from the side of the pot. Fully soak the soil and avoid spraying water on the leaves. Follow the instructions on the fertilizer package or add mature compost as flowers are setting. Taper off on fertilizer, especially nitrogen after plants flower. Nitrogen encourages the plant to put its energy into the leaves and not setting fruit. 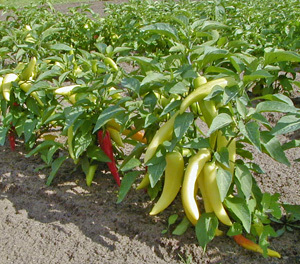 Sweet peppers can be harvested at any stage of maturity. 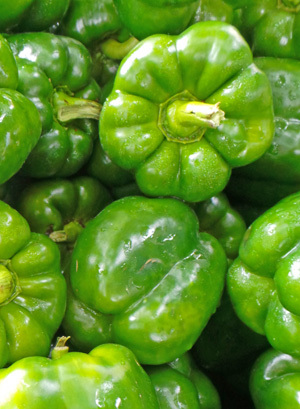 Less mature green peppers will generally be green or pale yellow, smaller, crunchy, and have thin walls and a slightly tart flavor. A benefit of harvesting early is that it triggers the plants to produce more fruit. Mature peppers will change color, have thicker walls, and a mild sweet flavor. No matter the stage of harvest, cut the peppers from the plant with clean pruners or kitchen shears to avoid damaging the plant. Fully mature sweet peppers don’t store well so eat them up. Extra peppers can be roasted and peeled and preserved in oil. There is nothing better than the aroma of roasting peppers filling the house on a late summer afternoon. With some simple preparation peppers freeze well. Sweet peppers are a great vessel for cooked fillings or cool dips. Chopped peppers can be added to soups, salads, and omelets. Peppers can be roasted by baking, broiling or grilling. If baking, heat the oven to 400 degrees. Line a baking sheet with aluminum foil. Place peppers on pan and bake, turning occasionally, until all sides are blistered and slightly blackened. If broiling, turn the oven to broil and follow the directions for baking, above. If grilling, set the heat at medium-high. Place the peppers directly on greased grates and continue cooking as for baking. Place roasted peppers in a heatproof bowl and cover with plastic wrap. Let steam for 15 minutes or until cool enough to handle. This steaming period will help the skins slip off more easily. When the peppers are cool enough to handle, remove the stems, skins, seeds and membranes. The peppers can be left in large pieces or cut into strips, although large pieces are more traditional. Transfer to a serving bowl. Add garlic, oil, vinegar and liberal amounts of salt and pepper to roasted peppers. Toss until well coated. Allow peppers to marinate at room temperature for 30 minutes. Then serve or refrigerate. Sweet peppers are eaten fresh, or can be roasted or frozen to preserve the harvest. No matter how they are grown or used in the kitchen, sweet peppers add beauty, variety and health to any garden or home. – Text reprinted from a National Garden Bureau Fact Sheet by Heather Kibble on the NGB website. I did not know peppers originated in South and Central America!